Editor’s note: An earlier version of this story ran in the Good Life magazine. In the spring of 2014, my wife, Shirley, and I attended a concert in Wenatchee. As people were filing out of the building, Shirley saw Paul Pugh coming down the aisle towards us. I am blind, so she told me when he was in front of us. Excitedly, I called out to him, “Hi Guppo.” He instantly replied, “Hi, Soopy.” Those were the last words that he and I shared. In the spring of 1960, a few months after moving to Wenatchee, one of my first good friends invited me to go with him to “Circus practice,” I had no idea that such a thing, as a youth circus, even existed. When my friend and I arrived at the circus lot, I was instantly captivated by what I saw. (I was not blind then.) My entire being wanted to be part of that. I was introduced to Mr. Pugh, and when he saw my interest, he invited me to join. He told me to ask my parents. That night I talked to them about it. (I probably begged.) My parents consented. Within a few days, my parents visited the Circus lot and met Mr. Pugh. My younger brother, Joe, and I were with them, and, when he saw the Circus, Joe, too, was instantly captivated. Thus, Mr. Pugh had both of the Anderson boys. I often joke, that Wenatchee was safer with us in the Circus, than it was with us running around town with idle hands. Joe and I had never been around trampolines, tumbling equipment, or unicycles. We had never been close to a tight wire designed for people to walk on, or a trapeze with its safety net. It was unbelievable to us. As the four of us stood talking to Mr. Pugh, we were watching children and young people practicing on real, authentic circus equipment. Dad and Mom were just as excited about the Circus as we were. 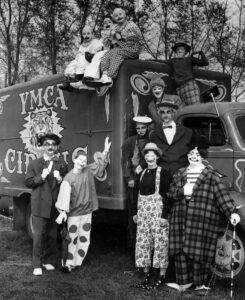 They soon loved and appreciated Mr. Pugh, and the Wenatchee Youth Circus. Dad welded, bolted, straightened, and repaired. Mom sewed, cooked, and bandaged. All four Andersons were now in the Circus. I was in the Circus for two years, and Joe was in the Circus for eight. Joe was highly successful, and later became a professional circus trainer. 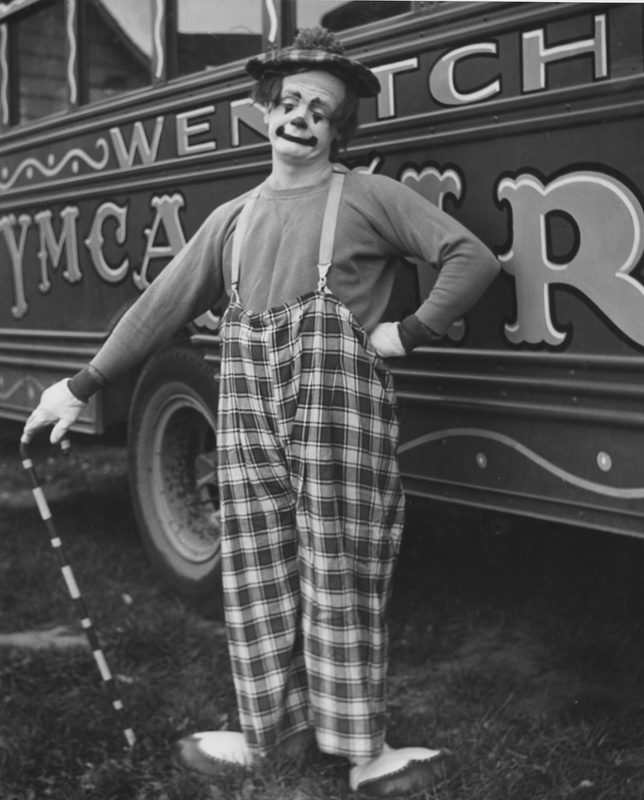 Paul Pugh had been a clown in the Clyde Beatty Circus, a large, traveling, world-class circus, and from this came the inspiration to share his passion with others. It was there that he learned about tumbling, gymnastics, daring circus acts, and clowning. 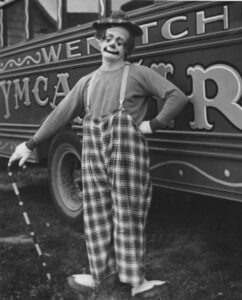 Clowning for Paul (Guppo) Pugh was a catalyst to involve children and young people in the thrilling world of circus life. He started a tumbling and gymnastic group at the YMCA, and, from that small start in 1952, came the Wenatchee Youth Circus; a real circus, where the kids were the stars! 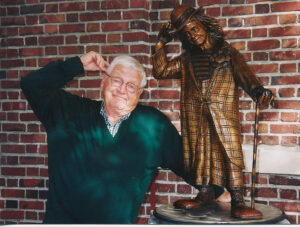 Paul Pugh loved clowning, but he never clowned around when it came to mentoring children and young people! When it came to those moments, he was extremely serious. When I needed to talk to him seriously, I learned to do it quickly and succinctly. He had a hundred children and young people, and their activities on his mind. During a Circus performance, he directed the band, watched each act, watched over property boys preparing equipment for upcoming acts, and he watched the reactions of the spectators. His eyes never stopped moving. He looked here, then he scanned there, next he looked at his watch; all of this time, he was waving his baton as he directed the band. Incredibly, Guppo also led us clowns in several clown gags. He was like a finely timed and tuned watch. To quote an old expression, “Everything was careful clockwork.” If our timing dragged or rushed, Guppo was an unhappy clown! The circus performance was only the culmination of all of the many activities. Consider feeding a hundred extremely active kids, many of them teenagers. There were also parents with other children, who accompanied the circus as it traveled. Mr. Pugh, along with several others, arranged the food service. This mammoth task involved meal planning, food purchasing, storage, preparation, serving, and clean up. In my opinion, especially considering all of the extenuating circumstances, the meals were very good. Circus performers are known for their bright costumes, and the Wenatchee Youth Circus was no exception. My Mother was an excellent seamstress, and she made costumes for Joe and me. Joe was involved in several acts, and each act had its own costume. I was Peesoop, the hobo clown, and had only one costume. Some of the other Mothers made costumes for their children. Then the mothers worked together to finish the demand for costumes. During the winter months, the circus didn’t perform. Mr. Pugh made arrangements for us to practice in a school gymnasium. Some of the larger equipment could not be set up in a gym, so as soon as spring came, we set up the Circus outside. Wherever and whenever the circus equipment was set up, kids were practicing. Sometimes people would enjoy watching the students practicing on the trampolines, and other equipment. They might have thought that the kids were just playing around, and having fun. Amazingly, some fantastic trampoline tricks were developed by playing “Follow the Leader,” on a trampoline; and the kids were, indeed, having lots of fun! Mr. Pugh knew young people, and gave them the freedom to experiment and develop tricks and stunts on the circus equipment. He offered suggestions, and was always encouraging. Mr. Pugh never stopped stressing safety, and he had no patience with foolishness. He placed spotters, even during shows, in strategic positions, to help protect performers from dangerous falls. The Circus kids spent hours preparing to perform and entertain. While some of the young people were performing, other kids were preparing equipment for upcoming acts. A circus show is a myriad of activities, with everyone working and doing his or her part. Some of the most enjoyable Circus activities were the setting up of, and taking down of the circus equipment. All equipment was stored in trucks. Every part had it’s place in the truck or trucks. When the trucks were being unloaded for set-up, everyone charged into action. Mr. Pugh selected a site for each act, then the pieces of equipment for the act were carried to that site. When all parts were in place, the kids started assembling the pieces of equipment. Muscles flexed and grew, as waists shrank. Believe it or not, as the kids labored, they ran, laughed, and made a game out of the work. These kids became physically fit. After the last show, there was the taking down and storage of the equipment. At this time, the kids were still moving briskly, but maybe not as briskly as at set-up. The kids were tired, and so was everyone else. Circus equipment required stakes to hold the equipment in place. I remember learning to pound 30 inch steel stakes, (old truck axles) deep into the ground using a sledge hammer. We young men needed that skill because several circus acts required hundreds of pounds of tension. The high wire and the low wires, and the trapeze net have to be extremely taut. Some of the pieces have automotive coil springs to absorb shock. This requires well placed and solidly held stakes, large and small pulleys, and turn-buckles. Every piece of the equipment had, at least, two stakes holding it in place. Therefore, driving stakes was a major task, and it helped develop our strength. An extremely amazing experience that we young men enjoyed, was driving the three brightly painted Circus trucks. There were several of us who shared this task. It was a tremendous privilege, and a huge responsibility. I was sixteen years old, when I started driving the trucks. This practice was discontinued in 1962, when the circus started using semi trucks. Only Mr. Pugh drove the Circus bus. Most of the young people rode the bus. You may be thinking that circus activities can be dangerous. That is true, but the kids loved it. I loved the work and performing. I worked much harder at circus than I ever did at home, and my attitudes were better. As we all know, when a hundred children, young people, and adults are involved in a dynamic organization that travels, the social life is dynamic. Everyone had to be considerate of everyone else. We learned to be patient and unselfish. We had to work and live together whether we were tired, ill, or homesick. Mr. and Mrs. Pugh were wonderful away-from-home parents. Guppo did almost everything. He guided the coordination and timing of every act. He even caught on the trapeze in the very early days. We had pep-talks, and sometimes we even had “family” correction discussions. On Sundays, for those who were not Catholic, he held a devotion time; while the Catholic children attended a local Catholic Church. He coordinated parent activities, and spoke to sponsoring organizations. Think of the insurance policies he had to negotiate! Mr. Pugh was amazingly courageous; maybe crazy. We all loved him, for the confidence and pride that he had in each one of us. This beloved man, Paul Pugh, died January 31, 2016. He left behind a legacy of grateful admirers. I cherish my memories of the exciting circus life: Driving the trucks, and driving the stakes. As a novelty act, I drove a Volkswagen Beetle with 30 plus kids in it. (This thrilled the audience.) It was called “stuffing the beetle.” Guppo was a genius at clown gags. Mainly I remember a man who loved people, and he wanted each and every person to have a smile on their face and a laugh in their mouth. At Mr. Pugh’s funeral, I visited with circus people with whom I had not spoken in many years, but friends for life. The circus is stronger than ever. The young people are terrific, and their skills and performances are amazing. We can all be proud of this current group, assured that the show is still going on. Mr. Pugh’s circus, where the kids are the stars: The Wenatchee Youth Circus.